Michael Wilce of Central London, UK took 20 composite shots to create this image of the Venus transit on June 8, 2004. On June 5, skywatchers around the world will be treated to a rare astronomical event when Venus dances across the solar disk for the last time this century. When Venus crosses in front of the sun, astronomers refer to this as a "transit." As the planet moves along its orbital path, it will travel across the solar disk, making it appear to observers on Earth as a small black blemish on the face of the sun. Prior to 2004, the last pair of Venus transits took place in 1881 and 1889. How can I watch the transit? As Venus passes in front of the sun, the planet will cover only a small fraction of the solar disk, which means observers need to protect their eyes. It is very dangerous for humans to stare at the sun (even mid-transit) without proper eclipse glasses or solar filters for binoculars and telescopes. To observe the sun, dense filters are used to block damaging rays. The only safe filters are #14 welder's glass, which is sold in specialized welder's supply stores. Special eclipse glasses are also available from telescope stores and astronomy clubs (they should only cost a couple of dollars). If you plan to watch the transit with binoculars or a small telescope, you will need a proper full-aperture solar filter. When and where can I see the 2012 transit of Venus? Venus will cross the face of the sun on June 5, 2012, and will be visible from many parts of the world. Since the event takes place across the International Date Line, the transit will occur on Wednesday, June 6 in Asia, Australia, Africa and Europe. Skywatchers in North America, Europe, Asia and eastern Africa will be well-placed to see at least part of the transit in person. If, however, you are unable to witness the event in person, several organizations will be broadcasting footage from observatories and telescopes online. For example, NASA will be hosting a webcast on June 5 that will last the entire length of the Venus transit. Viewers who tune in will be able to see the entire event unfold, through footage streamed live from t he summit of Mauna Kea, Hawaii. These views will be accompanied by commentary from astronomers and transit experts. The webcast is currently scheduled to begin at 5:45 p.m. EDT (2145 GMT). What time will I be able to see the transit of Venus? The transit will begin at around 6:09 p.m. EDT (2209 GMT) on June 5, and will last roughly seven hours. People located in the mid-Pacific region, where the sun will be high overhead throughout the transit, are particularly lucky because they will be able to witness majority of the event. Still, others in North America, Europe, Asia and eastern Africa should be able to see at least part of the transit in person. In North America, the best time to view the transit will be in the afternoon, in the hours before sunset on June 5. In Europe, Africa and Australia, Venus will be traveling across the sun as it rises in the morning on June 6. Skywatchers throughout most of Asia and across the Pacific Ocean should be able to view the event any time on Wednesday. Still, it's important to keep in mind that these guidelines are all contingent on local weather and conditions. 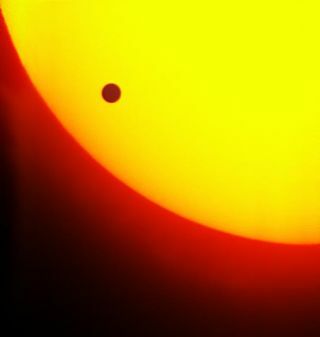 Can the transit of Venus be seen from space? Yes. In fact, NASA astronaut Don Pettit, who is currently aboard the International Space Station, is planning to be the first to photograph the Venus transit from space. Pettit is planning to snap pictures of the celestial event from the station's seven-windowed Cupola observation room. NASA's Solar Dynamics Observatory is also planning to watch the transit from space. According to agency officials, the satellite will use observations from the event to calibrate its instruments and glean information about Venus' intensely hot atmosphere. What are the different stages of the transit? Astronomers refer to different phases of the transit of Venus based on "contacts." When the planet first touches the outer edge of the sun, this is known as first contact. Second contact occurs when Venus appears to be completely on the sun. Third contact refers to when Venus touches the sun's inner edge, and fourth contact follows when the planet is totally separate from the sun.